Why are we not taxing churches? This image has gone viral recently and even Richard Smith of the Motley Fool has chimed in on the debate. The controversy stems around the fact that the IRS here in the United States is missing out on an estimated 71 BILLION in taxes – being that religious organizations are tax exempt in the USA. Well, let’s face it; our whole tax system is screwed up. I pay over 20% in taxes as a middle class citizen and rich guys like Mitt Romney pay less than 15% – go figure… I guess it can be debated either way depending on your political affiliation. Anyway…. …and don’t get me started on Religion and how it has suppressed technology since the fall of the Roman Empire. After all, it was only in the 1980s that Pope John Paul finally admonished Galileo for his theory that the Earth is not the center of the Universe – that’s another blog and another time. I guess my point is this – there is a lot of space outside of Earth’s orbit and our future is not on this planet but out among the stars. Do you really think Earth is going to be able sustain us in 500 years? How about 1000 years? Not at the pace of destruction we are waging on mother earth… Space exploration is important and we are way behind the eight ball when it comes to recent advances. Here we are living in a self-gratified world fighting over fossil fuels when we should be coming together as a planet with one mutually beneficial goal to evolve as a globe and not as the fractured world we are now. 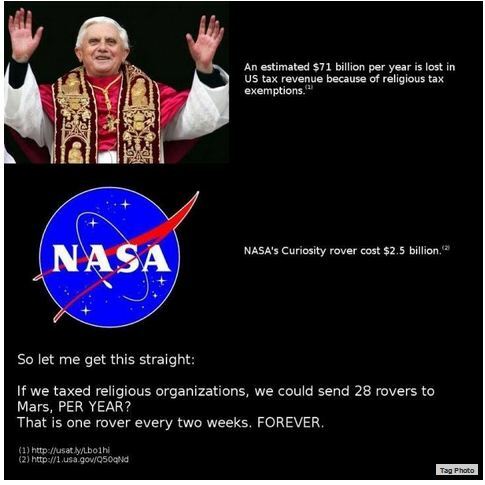 Well then the least we could do is tax churches – As far as I am concerned, they owe us big! What makes me curious is how much the Church, from its saved billions, returns to the people who need it the most vs. how much of that money is squandered into building mega churches with enough glitz and glam to make Jesus retch; or how much of that money goes into legislators’ pockets, so that the Church will remain tax exempt? Just my opinion: if the Church would stop its war against contraceptives, our worldwide population could very well decrease to a degree where the Earth would quite possibly sustain us in 500 years. I agree that ramped-up space exploration is necessary … I just think we should figure out how to repair the damage we’ve done to our home planet before we spread out to other planets. The Church could help with this, too. Not just financially (with its saved-up billions per year), but philosophically by ceasing to make people too afraid or ashamed to embrace and develop the science (technological and social) that’s now available to us. A final question, regarding what you said about our world being ‘fractured,’ is how much of that fracturing stems from competing Churches; and what part could an interested and involved Church play in healing those fractures?